We're going to travel up the Singapore River to study a couple of lovely old arch bridges. The Anderson Bridge was built in 1910 to carry the traffic that was overloading the Cavenagh Bridge (see February 7th), just as the Esplanade Bridge was built in 1997 to carry some of the traffic that the Anderson Bridge could no longer handle. By now we should be able to recognize the Anderson bridge as a steel tied arch. In fact, we can see the heavy steel tie under the bridge deck. This bridge has many beautiful details. The pedestrian railing is supported laterally by graceful steel members resting on concrete floor beams decorated with stars. Instead of the cables and concrete hangers we've recently seen supporting the deck, this bridge has large built-up steel members for hangers and slender diagonal members on both sides of the arch. The bridge is 70 m (230 ft) long and 28 m (92 ft) wide. There are three arch ribs, with two lanes of traffic between each pair of arches and a pedestrian walkway on the outside of the arches. The decorative cross-bracing above the arch ribs carry lanterns and there are two masonry arches at each end of the bridge. 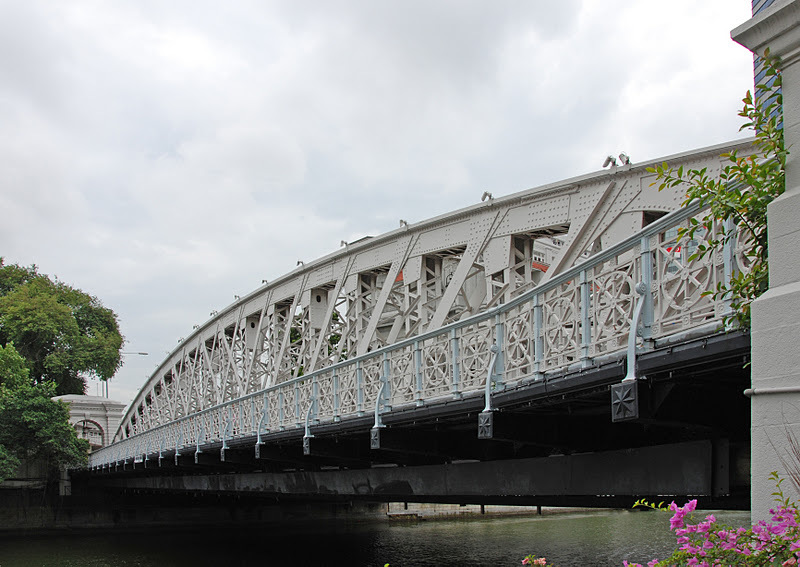 Singapore has done a wonderful job of preserving this elegant bridge. Singapore's Bridges: Anderson Bridge by Mark Yashinsky is licensed under a Creative Commons Attribution-NonCommercial-ShareAlike 3.0 United States License.